Listen up! The audio blogs are here. In this episode,we compare the merits of motivating yourself from an inner drill sergeant mentality vs. an inner wise woman mentality. Plus, Amy shares her favorite ways to tap in your inner wise woman for quick hits of motivation and guidance. In this episode, Amy breaks down the biggest problem with traditional networking and offers 10 step-by-step solutions to make networking a feel-good, effective endeavor. In this episode we dig into exactly why talking about our side hustles and passion projects can leave us feeling tongue tied, and Amy shares her favorite tips for building the confidence you need to share your brilliance with the world. 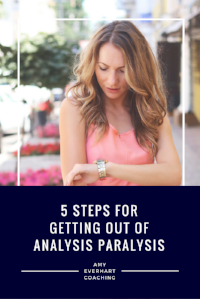 In this episode, we explore the true nature of Analysis Paralysis and work through each of the five steps for transforming analysis into action. In this episode, we reframe the idea of what it means to "back talk" and explore how a little personal rebellion can be a good thing. In this episode, we unpack the three biggest reasons your actual job title or business niche isn't the key to your career success. Then, we delve into exactly what to focus on to discover meaningful, impactful work. Don't forget to join the tribe before you go! Join the tribe and get instant access to Trust Your Truth, a free 5-day email course to kickstart your journey.